Last month, the boyfriend and I wanted to be a little spontaneous (hahaha) one morning so we decided to get up early and have breakfast somewhere in Makati. There are a couple of breakfast joints I wanted to visit for a while now (Brew-Kus, Mr. Jones, Apartment 1B and Agahan), so I thought this would be a great opportunity. After much internal debate, I suggested we try Agahan since it's already open early in the morning (7:00 AM, as per Google) and it's nearer from where we're coming from. With the help of Google Maps, we took a cab going to Agahan. We got off at an intersection and walked back a little. 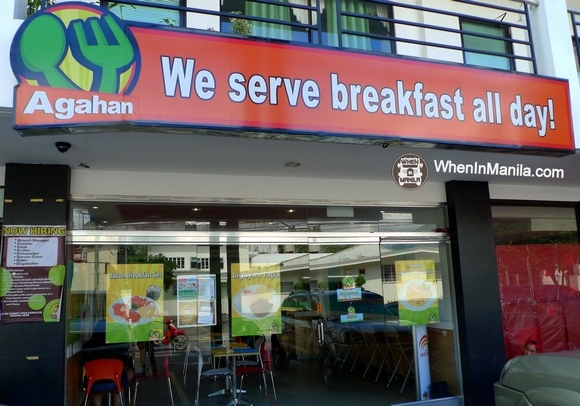 So, we finally saw Agahan's signage (refer to photo below) and we were really excited to eat! The only difference though is that when we saw the place, the pillars were painted white and there were blinds partially covering the entrance. I figured since the sun directly hits the place, they put blinds to lessen the heat. When we got inside, I was surprised and puzzled at the same time. As opposed to the loud, vivid colors shown, what greeted us were white, almost like those of hospitals, walls. The place was filled with Chinese (if I'm not mistaken) people giving us puzzled looks while having their breakfast. There was no menu posted and no one to ask about anything. We felt like we were transported into another dimension! Haha. After a few minutes of being awkward in such an unfamiliar territory, the boyfriend was nudging me to leave as something felt very wrong in that place. We slowly stood up and left the place and laughed hard when we got out. We hopped into another cab and asked the driver to drop us off at The Columns in Ayala because we figured we're just going to hang out at Moonleaf. But because we're such hungry young people, we decided to walk around so we could find a nice place to have our most awaited breakfast. I ordered this since I'm in a longganisa mood that morning. I enjoyed eating this but I hope they added more of the Vigan Longganisa. The Hamonado Longganisa (is that what it's called? Because it's shaped like one) dominated the dish. I'm a sucker for sweets but I'd still prefer a salty (or tasty) viand than a sweet one. Another plus was the tomatoes. I love tomatoes! I eat them in any way! The boyfriend's choice was this one, with an additional order of garlic rice. He told me everything on the plate was delicious and heavy, which is what he totally loves about the dish. I am not very fond of the baked beans (or any kind of beans, except monggo) but the sausage patty was excellent. The grill marks make it look more sumptuous. The meat was tender and juicy and very delicious! And yes, the chargrilled half tomato was a nice pop of color on the plate! You just can't deny that MoMo Cafe has the best value for your money when it comes to the servings and the quality of the food. And this time around, I was really happy with their customer service! We were laughing while having breakfast because of the misadventure we had earlier that morning. We sat around a little longer after we ate because we got tired of all the wandering we did. We talked about a lot of things and saw this huge dog that kind of looks like a Siberian Husky but it's coat is much fluffier! On our way back, I'm still bugged by our experience at Agahan. The question, "What the hell happened?" was still loud inside my head. So I googled the keywords Agahan and Makati again but this time I added the word closed. And yes, ladies and gents, I just found out that Agahan was already closed since last year! Apparently, I didn't do my research enough. But in my defense (haha), when I checked Agahan's official website then, there was no announcement that they already closed. I told the boyfriend immediately and we can't stop laughing! But both of us were curious as to what was that place we just went to and why they didn't bother removing the Agahan signage? A canteen perhaps? I don't think we'll ever know.